Brand: Kolorjet Chemicals Pvt Ltd.
Green chrome oxide is a pigment for paints. Green chrome oxide is often used in industrial paints where a lot of wear is involved. For example, military vehicles are painted with green chrome oxide paint. It retains its color in high heat and light exposure, making it ideal for outdoor applications. Chromium Oxide is used in the preparation of paints, glazes, whitewash, plasters, coating, concretes and waxes. The Chromium Oxide is used to create dark green colors. Chromium Oxide is very resistant to U.V. We offer chromium oxide green for refractory manufacturers. Our chrome oxide is widely accepted by Indian Refractory Manufacturers for making bricks, mortar, castables and other refractory items. 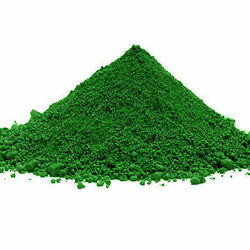 We offer a qualitative range of Chromium Oxide (Green) Pure to our clients. This chromium oxide green has a wide variety of uses and is widely used in polishing gemstones, pigments, ceramics, metallurgy, grinding wheels and refractory. 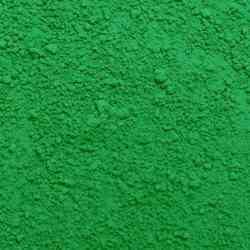 We manufacture this chromium oxide green for all the uses and our product is best preferred in pigments and ceramics for its sharp color and large coverage area. We are engaged in manufacturing all kinds of chromium pigments.